Left foot forward (a journey into reenactment): Balls and Turnips. 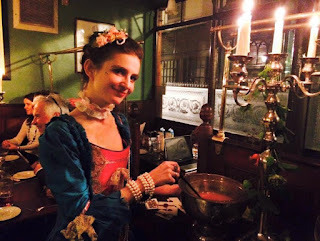 Back in the early days of summer a notice went up for a Georgian dinner in London, at what is a traditional day time chop house dating back to 1757, an event run by Miss B and Miss Kitty Pridden.. I decided it would be an experience and an opportunity to wear a big hat. On a related note there was a big dinner and ball held in Brighton just under two weeks ago, right on my doorstep, that I was completely oblivious of! I felt a little miffed at first but when some splendid pictures emerged from Alan Balding I wondered if I would have been comfortable, dancing is not compulsory nor would be an extensive knowledge of ettiquette.. yet still.. it looked suitably reserved that I felt my usual reenacting role as a French soldier out in the fields might kick in and I might have to give a hearty BOOO as the 'Victory of Waterloo!' 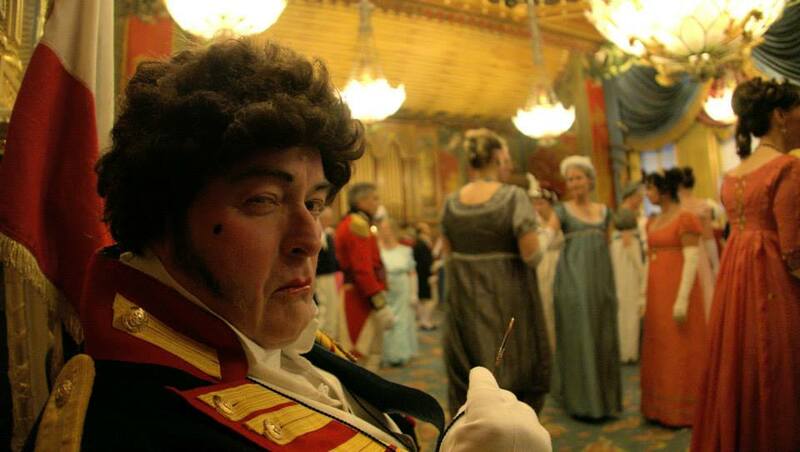 was cheered and then kick the Prince Regent (Below) up his sizable arse, before fleeing to take Lydia Bennett up the servant's quarters. My outfit was a bit of a thrown together officer and a gentlemen guise, revolving largely around a green Schwarzburg-Sonderhausen (German) jacket which is sadly awaiting the arrival of it's epaulettes and appropriate grey trousers, but no matter, there would be plenty of generic Georgians in attendence. I considered wearing a sword but was hesitant incase an overzealous Bobby decided I should not be wearing it around London town, not that likely but it would marr the evening if it did happen. The internet didn't help much as it is obsessed with knives, knives, knives and guns. Not a whit on whether a Gentlemen can wear a sword to dinner. So a swagger stick would suffice for dash and thrashing any street urchins. I'd peered at maps of how to get there but wasnt sure of scale, as it happened I arrived early and quite thirtsy from hurrying so that I took to the Jamaica wine house for a pint and stood amongst a horde of besuited men, Thursday night drinks is apparently the done thing in London business circles, indeed every pub I saw was spilling out onto the street. Arriving back at Simpson's tavern I was ushered inside by a bearded waiter and introduced myself, being given a playing card and a glass of gin punch and chatted to some other guests and the charming hostesses as I awaited my friends. 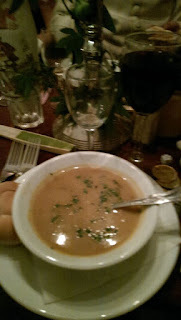 Upstairs at the tables my first course was spicy turnip soup and the banter was already flowing, punctuated by tales of local characters and dinner trivia, and a guest giving us a rather operatic song. 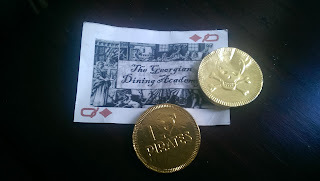 Each table setting also had a stack of (chocolate) coins and a dice and the gambling begun, Poor James was cleared out, and I quit whilst ahead. 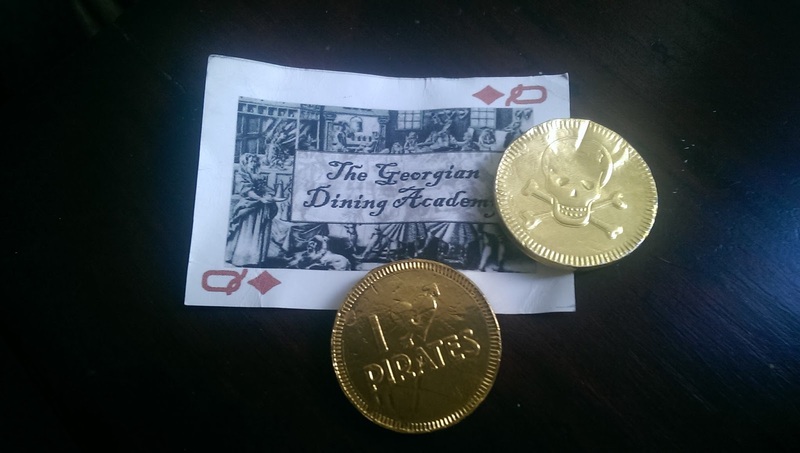 Coins were also good for tipping the lovely waiters, which paid off as I ended up with an extra pudding, always get the staff on side! My main course was a big pie followed by a cinnamon Jelly, that was not actually jelly as we know it but rather a spiced boozy drink with fruit in it, which was good because I had half expected it to be a dollop of animal jelly. not so. 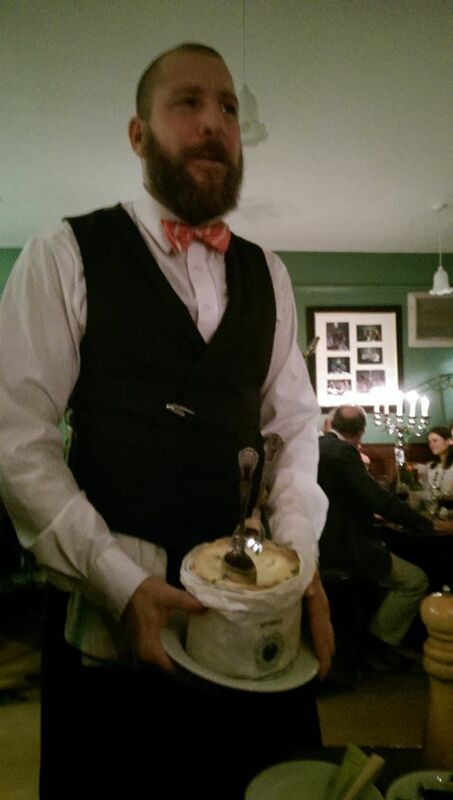 and of course where there is cheese and puddings their is port. 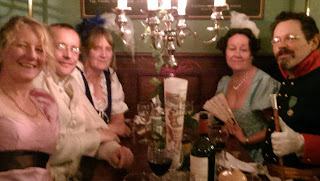 It was a great night all round and more like a party than 'going to a restaurant' and all being paid for in advance their was no menial and petty business about money at the end, also you didn't just get a drink with each course, when a bottle was empty another would just magically appear. Although not strictly a reenactment event I felt it was very much the full experience of the time, the jollity, the indulgence, the decour. The original idea was more early Georgian, 1750s stylee, when there was a lot more lace, big frocks and Wiggery but those who dress up tend to include the Napoleonic sort and no distinction is made, indeed you don't even have to dress up, although WHY WOULDN"T YOU? Tootling back to Blackfriars I felt people were making way for me, a couple even apologised for almost nearly being in the way, aaah it's good to be an officer and a gentlemen out on the town and having a fine old time of it, just have to watch out for the debtors gaol. Damn bailiffs. Maybe going again in December, but now it is time to start getting stuff out for Bovington which won't be quite such salubrious surroundings. Back in the ranks, back in the mud!